I’ve been spending a lot of time this week wrestling with John 14. I’m teaching on that passage this week to close out our John series. Justin Fox will be our guest worship leader. There are lots of great concepts there. I was thinking this week that I wish Jesus had listened to Andy Stanley when he said, “Teach less for more.” That might make my job a little easier. But I digress. I’ve been wrestling with exactly what the big idea should be. I’ve been trying to figure out where to go with the message. Then I had a good chat with Dan Albrecht last night. He is a Bethany professor at our church who has been teaching our John bible study on Wednesday nights. 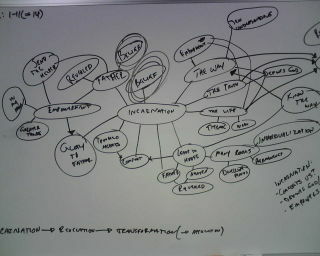 He threw out the concept of mind mapping and using the right brain to get all the ideas out and help it take form. This morning I woke up at 6:30 and started doing it in my head and it just came together. So I raced to the office to get it on my whiteboard before my 7am coffee with Lipert. Probably looks pretty messy to most of you. But it all has more form in my head now! What? No circle for Jack Bauer? I’m sure you could work him in somewhere! I love the Fox family! I don’t know Justin very well, but I know his wife and kiddos. Great family!